We need fresh eyes to look at our outdoor living area problem. We are desperate for some ideas for the west side of our pergola which heats up in the afternoon sun. 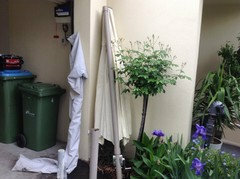 We've looked at a motorised awning, but not sure that it will fit under the gutter or that it will be suitable on windy days. Considered a cantilevered extension which we could put shade cloth over, but we've been told the beams would fall down. We've also considered a shade sail but where we would need to put in the uprights we have a brick retaining wall so it would be awkward. Husband is not keen to add the uprights for this and is also concerned about winds. 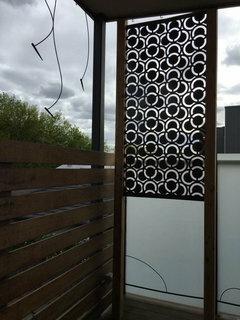 I also considered outdoor type curtains but the screen panels in the pergola concertina when we want t open the area up, and the curtains would be in the way of this. 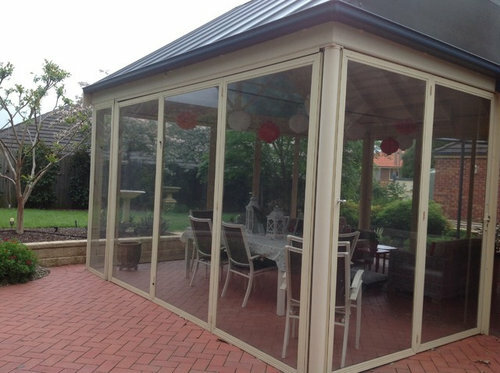 A motorised awning would be a good option as it will give more covered outdoor space as well as reduce the Western sun. They usually have a wind speed sensor an retract once the speed too high. It looks like it would fit under the gutter. 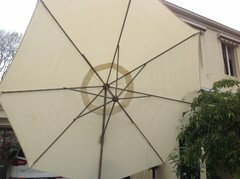 Shade Sails should be engineered and well built as they work like a sail when windy! They can flap and annoy the hell out of everyone if not done properly. We have just had installed two 85% zipline awnings with remote. We have also taken up the option of having a wind sensor installed. When wind reaches a certain speed it rolls inself up. You have to wait 10 minutes before putting it down again. It also acts as a mozzie protector. The darker the material the more you can see through. We are amazed at the clear vision. Thanks for those suggestions. I'll follow up the products you've all mentioned as I'm not familiar with them specifically. Oklouise, the concertinas are the large panels and they swing both inside and outside. The room itself is really functional except for his issue with the hot western sun. We installed louvres overhead but it meant getting plans 3K to install them. Also it didn't help with the sun going down so ended up with privacy screens still got one more for the other side. Not sure what the glass is but a 'film' on it may help to reduce the light/heat transfer whilst you look at other options. Deep planters outside with fast growing bamboo or large plants will also do the trick and soften the structure. Bamboo slender weaver 6-8m tall in the ground or Bamboo Fargesia Fortune to 4m tall. Each are clumping, non runners and only grow to 1.2m wide - less if contained in a walled trench. Thank you for all the ideas. Sometimes you think about something so much you can't see solutions. Like the ideas of umbrellas or awnings. We have 80 mm of the timber beam available to put an awning on. I think they're wider than that.☹️☹️ (There is a bolt in the beam that protrudes 2cm, it's not easily seen in photo as it is painted cream). An awning would need to sit underneath this bolt. cantilevered umbrella. I think we'd need to concrete the base into the ground and remove the pole during winter. The brick area is a play area - netball etc. Any pros or cons to this idea? Do you live in Melbourne Cath? 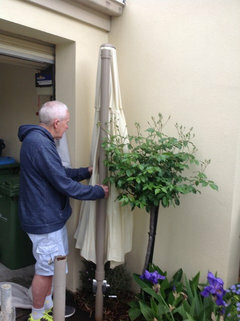 I have a huge cantilever umbrella in Ivory colour that turned out to be too big for my courtyard. I paid $800 for it at Rob Cousens but will sell for $200. It does need to be concreted in and I have the fittings. It's taking up room in the garage. Other than that, maybe get a curtain company to come out and see if outside blinds can be fitted to the panels individually, so they won't interfere with opening and closing. I will measure tomorrow Cath. I also have the receipt. I will get the measurements tomorrow. I also have the receipt. Be careful with the canterlevered umbrella. We had one but it was ruined in a wind gust, the arms bent. Too expensive to get fixed. Hi Cath, here are the pics. It is a bit hard to hold being so large. There are the accessories and cover too. It measures 62 cm deep X 124 across. I never left it open, either closed it down or put in garage. Opening up enclosed deck- or not! Exterior dilemma!